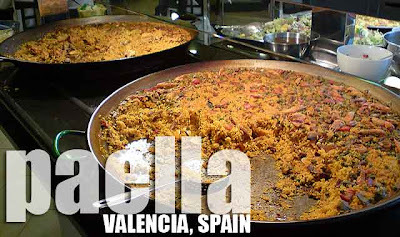 Where else to have paella other than in Valencia where it's from! That's right, paella is a Valencian rice dish which is quite popular here in the Philippines. They say the traditional Valencian paella is not made with pollo (chicken) but with conejo (rabbit). Yes, you read right, rabbit! We were looking for a great value restaurant to savor paella in Valencia since it's quite pricey given that rice here is expensive. And we finally found our restaurant called NECO Buffet de Cocina Mediterranea. 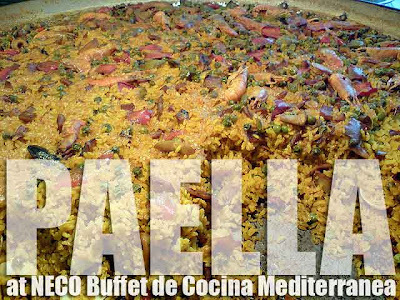 Not only did they have two kinds of paella served in humongous paelleras in their buffet. They had a host of other Mediterranean dishes and desserts as well, all for the price of 10€, not bad given that in most restaurants, paella could go as much as 15 to 20€. And that's just one serving! So the buffet was a great deal. I haven't had rabbit yet. Thank God! And I'd rather not. Hehe!